30 April - 30 September. 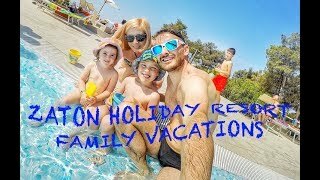 Zaton Holiday Resort is a modern family holiday park with a 1.5 kilometre private sandy beach. It is close to the historic town of Nin and just a few kilometres from the ancient city of Zadar. 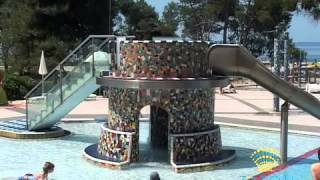 This park itself is more like a large village and has every amenity one can think of for a holiday on the Dalmatian coast. The village is divided into two areas separated by a public area with reception, bakery, shops, restaurant and a large car park, one for campers close to the sea, the other for a complex with holiday apartments. Zaton has 1,030 mostly level pitches for touring units, all with electricity, water and waste water. All numbered pitches have shade from mature trees and some have views over the extensive, 2 km long sandy beach and the sea. Access is off hard access roads. Zaton caters for everybody’s needs on site with numerous bars, restaurants, shops and two swimming pools. Excursions are organised to the Krka waterfalls, the Zrmanja Canyon and the Kornati, Paklenica and Plitvice National Parks. A member of Leading Campings group. Five modern and one refurbished toilet blocks with washbasins (some in cabins) and controllable hot showers. Child size washbasins. Family shower rooms. Facilities for disabled visitors. Outdoor grill station. Motorhome services. Car wash. Shopping centre. Restaurants (self-service one has breakfast, lunch and evening menus). Several bars and kiosks. Water play area for children. Heated outdoor swimming pools. Mini-car track. Riding. Tennis centre. Trim track. Scuba diving. Professional entertainment team. Teen club. Games hall. Beach extension with climbing pyramids. Live shows on stage by the beach. Free WiFi. From Rijeka take no. 2 road south or A1/E65 Autobahn leave at exit for Zadar. Drive north towards Nin, Zaton Holiday Resort is signed a few kilometres before Nin.